A career in the U. S. Army in the second half of the twentieth century was a passageway to every conceivable locale, hospitable and decidedly otherwise. Henry Gole's experiences lead the reader through the geography of one such career. Unfortunately, due to sales rights restrictions, we cannot offer Soldiering for sale in your country. A career in the U. S. Army in the second half of the twentieth century was a passageway to every conceivable locale, hospitable and decidedly otherwise. Henry Gole's experiences lead the reader through the geography of one such career. The recollections of a professional soldier, Henry Gole's account is a humorous and interesting tale of a man who loved soldiering but not necessarily the organization in which he soldiered. He feels the gratification of having served in the U. S. Army during an era when, personal doubts and political controversy notwithstanding, the world depended on America and its armed forces to preserve freedom. He offers the unique perspective of a member of the "silent generation,” those who immediately followed the World War II generation but find themselves often overlooked by historians and the media. 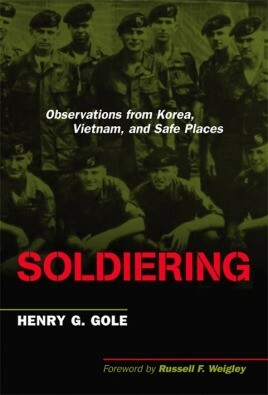 From 1952 through 1988, covering the ordinary rifleman's view in Korea to the Green Beret's war in Vietnam, Gole also provides fascinating insight into the professional military at war and how these professionals relate to each other, both under great stress and during periods of decompression. Containing a wealth of leadership lessons that will serve as an invaluable guide for junior NCOs and officers alike, this thoughtful and introspective warrior has also written a moving tribute to the brave soldiers with whom he served.